Like most people living at the time of ‘9/11’, I experienced the events of that day via media, initially through radio and then television. 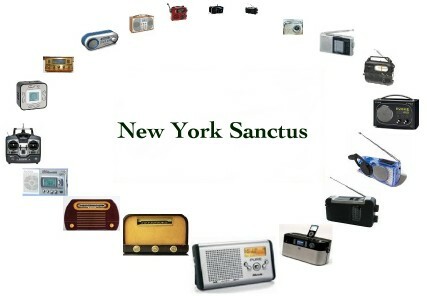 New York Sanctus is an installation that uses up to 30 radios to play back real-time recordings from radio stations around the world in the moments before news of the 9/11 tragedy breaks. It fades from one broadcast to another giving a unique glimpse of the last moments of an era that is ending and of the beginning of another. As each broadcast begins to relate news of the tragedy so that broadcast fades away and is replaced by a single singing voice so that, one by one, each broadcast fades away until eventually we find ourselves surrounded by a choir with each voice on a separate radio. For most people living at the time of 9/11 it was experienced through media. For me the impact of this work is in not mentioning 9/11 but in allowing the deeply affecting chatter around the world as it was happening to speak for itself. And as the singing voices slowly replace the real time broadcasts the audience is provided with an environment that invites deeper reflection on the events of that day and their consequences. 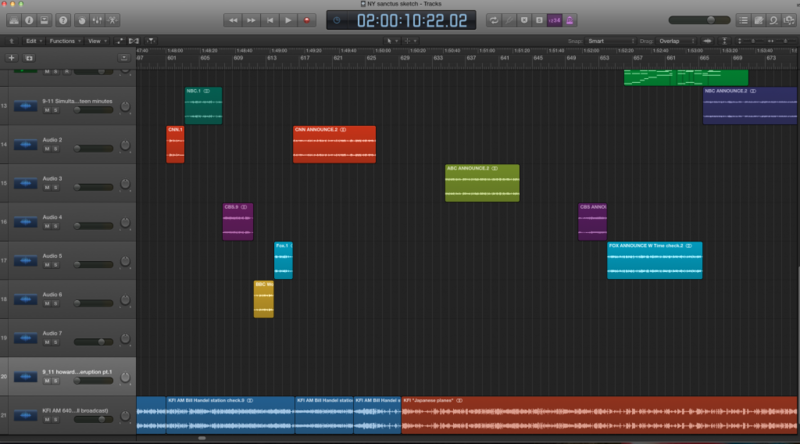 My goal is to reflect the archival recordings rather than steer them towards an end. There are some striking ironies and what appear in retrospect to be prescient comments, for example, just as CNN are giving the very first report of a plane hitting the tower KFI in Los Angeles are chatting in jocular tones about kamikaze pilots in Japan. The recordings are a typically diverse collection of gossip, sports, weather and traffic news – each becomes poignant once we know its context. Rather than a single ‘choir’ the work presents a collection of individuals singing together in that, each radio plays back only one voice, reminding us of the fact that behind the bulk statistics are individual lives and stories. I do not want the voices to sing text, it seems to me that any text would add a commentary and even choosing a language can be seen as divisive (the piece itself is, of course, a commentary of sorts, but it seeks to open out questions and experience rather than give conclusions). Instead I want to use ‘prosody’ the melody of the spoken voice on the radio as the start point of each of the separate melodies: if we remove words we discover we speak a common musical language which linguists refer to as ‘prosody’ the melody of the voice. While subject to differences from language and culture, the pitch, rhythm, tone and dynamic we use for love, fear, hope, play etc are common to all people regardless of gender, ethnicity, politics, religion etc. Little by little the separate lines knit together so that, while each voice is unique it becomes part of a unified choir. I do not presume to provide answers but I believe there is value in deep introspection and shared experience of the questions. The consequences of the events of 9/11 are felt in everyone’s life to this day. My hope is to create a space where we glimpse an era ending and a new one beginning. And to give some sense (offered in statistical form) of the causality: the flow from the event now known as ‘9/11’ leading to other events around the world. This may be in the form of something as simple as a noticeboard listing statistics alongside the radios. I want to avoid labels such as ‘terrorist’, ‘army’ or ‘civilian’ in order to view the human cost more objectively to give some sense of the scale of loss and suffering that flow from it, up to the present day.